Okay, first thing’s first…Robert Byrd, alias Bobby Day, of the Hollywood Flames, who were formerly The Flames, is not to be confused with Bobby Byrd of the Famous Flames, who were formerly…The Flames…got that? Good! Robert James Byrd was born July 1, 1928, in Fort Worth Texas, and moved to Los Angeles in 1947. His first vocal group, The Flames, originated in 1949, when all members were in there teens. They all met at the Largo Theater in Watts at a talent show given by the theater’s owner, which brought together many singers from various high schools in Los Angeles. Bobby strung together tenor David Ford, second tenor Willie Ray Rockwell and eventually Curlee Dinkins, who sang baritone and bass (Byrd would sing bass, baritone, tenor). They quickly learned how to sound pretty darn good together, and as they all needed to earn some dosh, they decided to brave up to an audition they had heard about at the Johnny Otis owned Barrelhouse. They started winning a few prizes here and there and were offered a few little jobs, sometimes making five dollars each. The Flames existed from 1949 to 1966. In that time, they recorded under a bewildering variety of names (Four Flames, Hollywood Four Flames, the Jets, the Ebbtides and the Satellites), for a bewildering number of labels, with a bewildering cast of personnel. In ’57, Byrd penned and recorded the great, Buzz Buzz Buzz, (Earl Nelson on lead) as The Hollywood Flames on Ebb. When the song became a hit, Bobby found out that he didn’t have any publishing rights and only half the writer credit…and never received any money owed to him. That same year with his back up group the Satellites, he also wrote and recorded (as Bobby Day) the fab foot tapping hand clapping Little Bitty Pretty One, released by Class in August. Popularized with success for Thurston Harris, whose release beat Bobby’s out the gate, it reached No. 6 on the U.S. Billboard Hot 100 and No. 2 on the R&B chart…but I much prefer Bobby’s! But the next year Day was the first to record Leon Rene’s (under the pseudonym of Jimmie Thomas) Rock-in’ Robin…the perfect counter attack, and Day’s most recognize and successful recording, which became Number 2 hit on the Billboard charts! Its flip, “Over and Over,” was a hit in its own right, and a cover by Dave Clark Five in ’65, brought a much more hip, modern youthful version back to the dance floors! Bobby Day went on to partner with Earl Nelson and recorded as Bob & Earl from 1957 to 1959 on Class. 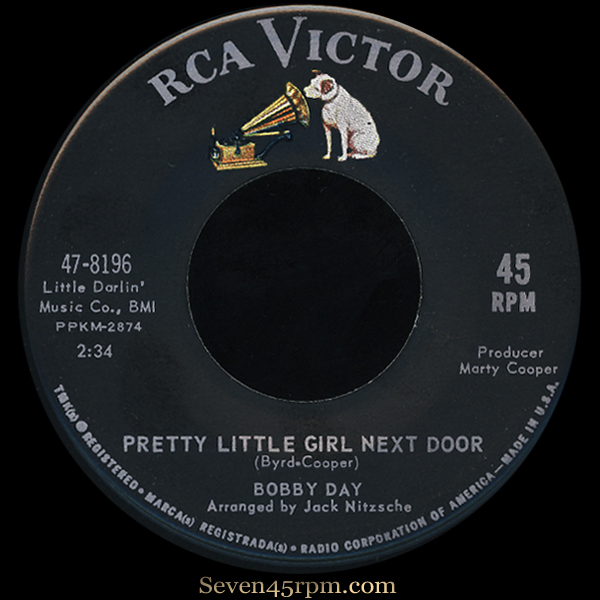 Moving on to 1963, and Bobby releases the incredibly uplifting Pretty Little Girl Next Door on RCA. I’m sure everyone reading this, has one song that they can rely on, that will always bring themselves a big damn smile, no matter what life is throwing at you! This is mine! From beginning to end, it’s a quite the pleasant build up. With it’s sweet caterpillar like beginnings, it quickly sprouts it’s wings and soars! The slinky groove grows, and it soon smothers you. And I’ve proved that this song can and will draw everyone within a kilometer radius of your turntable, onto your dance floor. Day gives it his all…he really shines in this one, and of course those gorgeous female backing vocals brings it all into perfect harmony! Imagine seeing this performed live by Mr.Day in ’63! And on the flip, what a delight to have a revisit of his early Buzz Buzz Buzz! 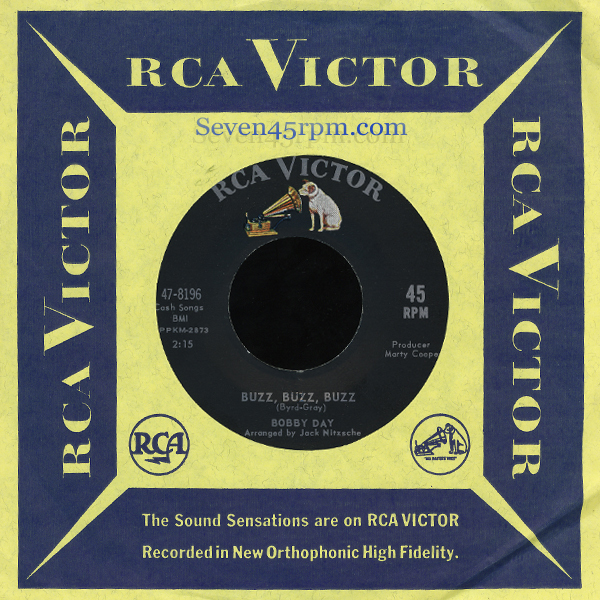 Just as great as the original, however this version may have a slower tempo, but certainly holds a stronger groove…and much more developed for the early sixties hipster dancers. Both tracks produced by genius Jack Nitzsche! Bobby Day died from cancer on July 27, 1990, in Los Angeles and was buried in Holy Cross Cemetery in Culver City, California. He was survived by his wife, Jackie, and four children. 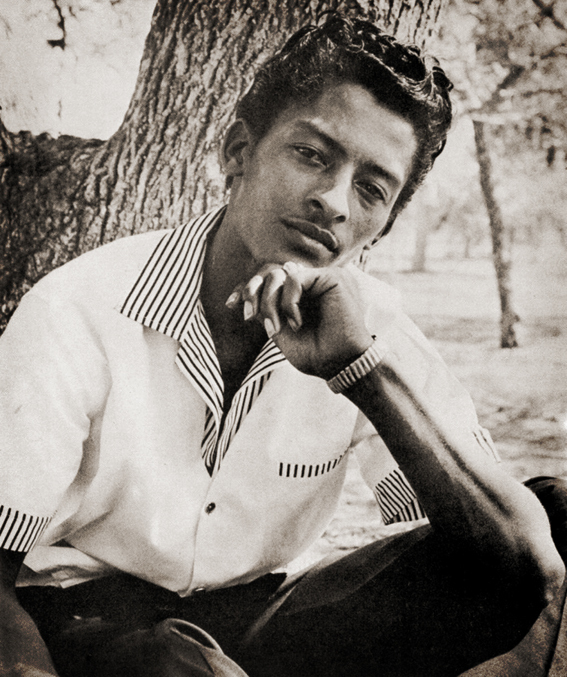 He may not have had the successive chart success he very well deserved (he never achieved another Top 40 Hit apart from Rock-in’ Robin), but in my book, he was just as important as the best of them, especially with his major part in the early days of doo wop! He always lifts me, and Pretty Little Girl just makes me drunk with happiness! Essential reading for a very in-depth and thorough journey with Bobby Day and his Hollywood Flames, by Marv Goldberg…The Hollywood Flames.